Flocks of doves take to the air as a new day dawns upon the darkened forest. A buck and a doe greet the dawn at the edge of the woods–curious, alert, yet unafraid, sure of their place not just beside each other but also in the forest; it belongs to them as much as they belong to it. 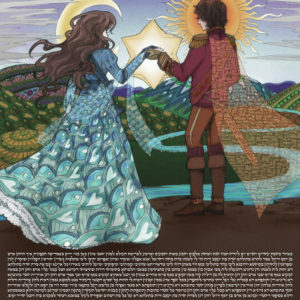 The Forest Keepers is perfect for the down-to-earth couple that exists in quiet harmony with the world and each other, mindful of the old ways and aware of its role in maintaining the tree of life. May the seeds you sow together rise tall as the forest that love and faith planted. This is a Papercut Ketubah: it is made with two layers of paper–a laser-cut design mounted atop a background. The Ketubah text is printed on the background paper and then placed carefully underneath the top layer of the cut-out design, eliminating the possibility of accidentally crushing or ripping the delicate structure while signing. Everything from design and layout, to the crafting process and final creation, lends itself to a high-quality work of art and overall attention to detail. 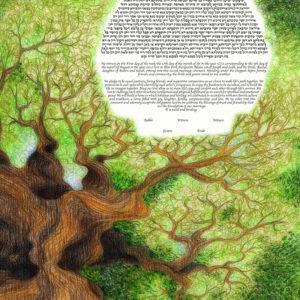 This beautiful Ketubah embodies the green color along with the tree branches to show serenity and a lifelong promise of harmony, faith,hope and love. The colors such as dark, light and all shades of green and brown seem to be interwoven effortlessly in this Ketubah. These colors reflect the artist’s beauty, skill and style in this masterpiece. The branches of the tree start from bottom up, elegantly covering the bottom of the Ketubah but leaving the top perfectly peeking through. 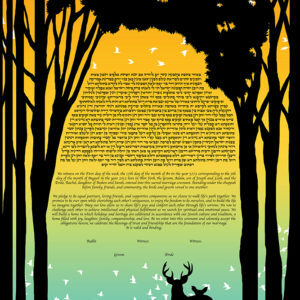 This Ketubah is perfect for the couples who love nature and the calm that it brings with it. Just like how the nature has a perfect plan for everything, your marriage too will unravel in all its magnificence and become better with each passing day. Just like the budding tree and the flowers, your bond will strengthen, grow and become as strong as the tree sky scrapers themselves. This Ketubah is ever-changing and will allow the two of you to witness the world’s nature together so that your bond will be a testament of time. This Ketubah depicts the moon in all its beauty radiating beams of gleaming light to take away the darkness of the night filled sky. This piece shows a beautiful silver moon light on top of a black background so that we can truly appreciate the artist’s skill. The twinkling little lights in the ketubah just make it so much more beautiful as the moon is illuminating the entire painting in a subtle yet breathtaking manner. 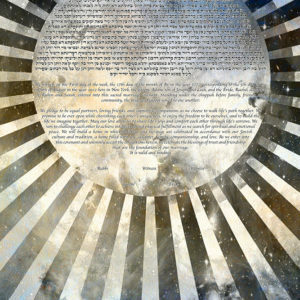 This Ketubah is for that particular couple, who glow as bright as the moon when they’re together. This Ketubah will make your marriage shine so that the two of you are in perfect harmony. Just as the moon and the sun balance each other to give the world its night and day,the two of you will complement each other in every step of life’s beautiful journey. The moon shows hope, love and tranquility and that is indeed what your marriage will be all about. Known throughout history, the moon lifts the darkness and fills everything with its glistening beauty. 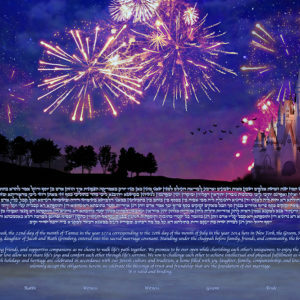 The Magical View Ketubah showcases vibrant fireworks to mark the start of something beautiful – a blissful marriage. Fireworks represent joy and happiness and no celebration is complete without this beautiful dance of colors. In this painting the bright blue represents the beautiful serene sky and the fireworks seem to bring life, illuminating the sky as burning streaks of light. The Ketubah text can be written at the bottom in white so that it beautifully stands out from the rest of the lovely picture. This Ketubah is for the couple that loves each other endlessly and wants to live life to the fullest. The couple that wants to be together to enjoy the beautiful happiness of their marriage and to greet each day as a celebration of their union. A modern day Ketubah that represents an explosion of love and happiness through alluring fireworks is the perfect way for newlywed couples to start their lifelong journey. A ketubah inspired by the restless ocean stirs up an aura of fresh winds, clear waters and a limitless horizon. The vast stretches of water that engulf more than half our planet has inspired man since the dawn of time and continues to do so. The ocean nourishes earth and stabilizes life as we know it. Without the ocean, life would be impossible. This ketubah is perfect for people who find their relationship to be full of surprises no matter how long they’ve known each other. Their companionship never grows old and constantly remains fresh and uncharted like the infinite ocean. The bright and dazzling colours of the ocean paint a background for couples who deeply depend on each other, and can’t imagine life without their partner. The unexplored cosmos has fascinated men from the beginning of time, twinkling high above in different angles but always the same pattern. Akin to the nature of relationships, outer space is infinitely large and impossible to predict; a place we are all aware of but know little of. The spellbinding image of galaxies far, far away invites couples ready to take that first step to travel the journey of life into the unknown together as one. 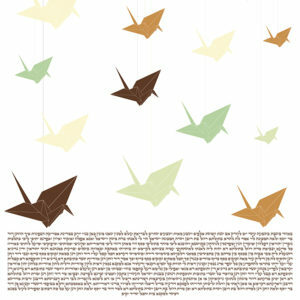 This ketubah is perfect for couples who are ready to shed their old life, for a new one with their loved one. 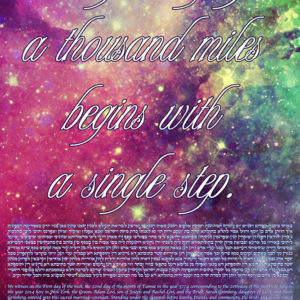 A journey of a thousand miles begins with a single step; this ketubah signifies the first step of that journey. A ketubah for the adventurers and explorers is the perfect beginning to start a new life with a big bang. 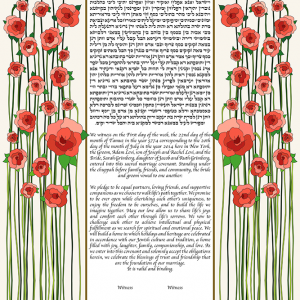 A garden of thorn-less roses stands guard on either side of the ketubah’s text, humbly bowing down in agreement to the couple’s commitment. The red flowers stand proudly in full bloom on tall stalks, each more splendid than the other. They have stood the test of time and battled all storms safeguarded by consistent love and care. The thorns signifying pain and initial disharmony in a relationship have been plucked and healed, leaving no scars behind exhibiting acceptance and companionship. This ketubah is perfect for couples whom have known each other for a long time. Their love has only grown with each bump in the road and continues to flourish. Like the ancient rose which has symbolized love and compassion for thousands of years, this relationship will stay true to its values and devotion for as long as they both shall live. 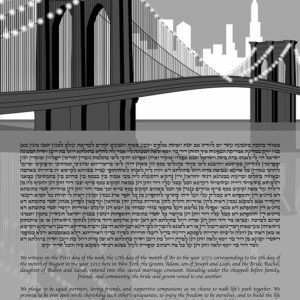 A monochromatic image of the Brooklyn Bridge against the city's recognizable skyline paints the an elegant background for a chic Ketubah. The always-busy bridge is devoid of the city's hustle and bustle and sparkles in utter silence over the still river. Lights illuminating the architectural pathway is a gentle reminder that it is alive and ablaze with energy. 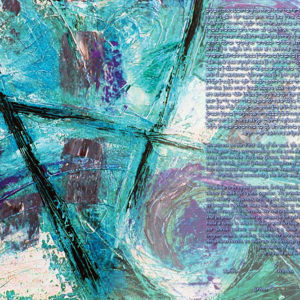 This Ketubah is perfect for couples who have built a strong and firm connection upon an unbreakable foundation. The bridge signifies the common ground constructed by different people across turbulent waters. Lovers of the The Big Apple will also adore this sophisticated piece of the Brooklyn Bridge as an embellishment to their Ketubah. Dazzling in shades of magenta, plum and gold, the rusty landscape of Mars is featured in this celestial inspired Ketubah. 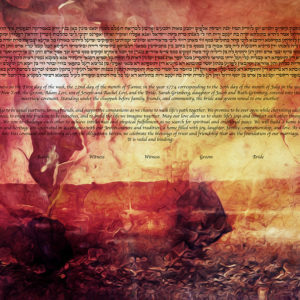 The golden center of the Ketubah is a depiction of the sun’s far reaching light and warmth on the silent red planet. The golden star’s rays flood the horizon symbolizing God’s presence from a biblical perspective. 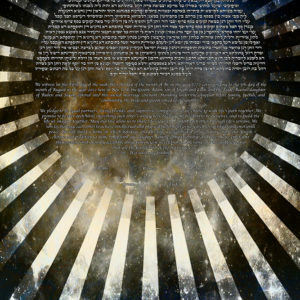 This Ketubah is perfect for unique couples who are out-of-this-world. Their relationship may be worlds apart from society’s expectations, yet they hold God firmly at the center of their core.